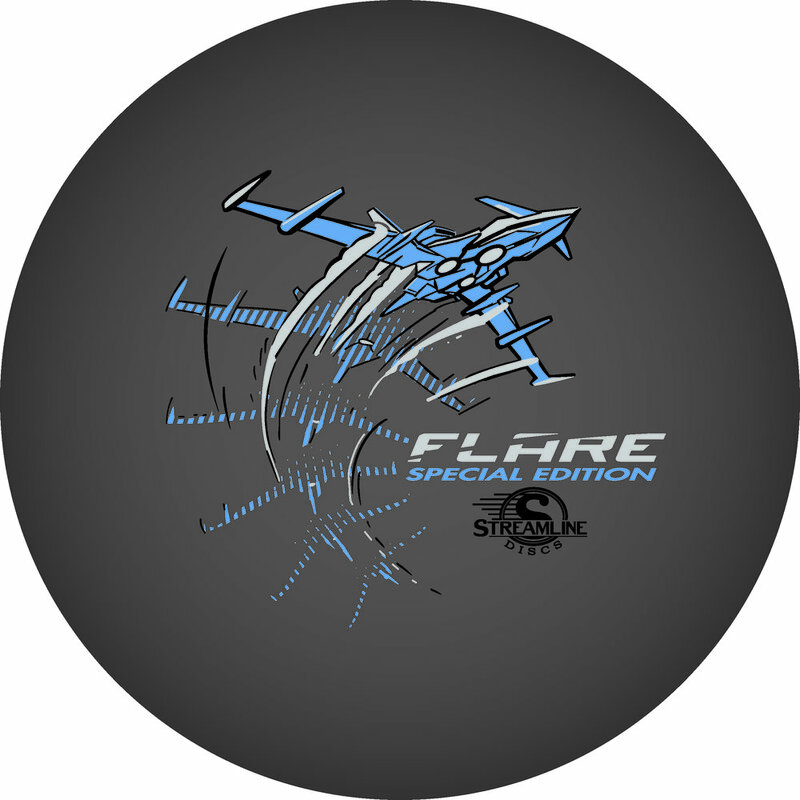 The Streamline Flare is the newest Fairway Speed 9 driver delivered with plenty of overstability for even the strongest arms in the disc golf game. I was asked to design around that special ability of the disc to fight out of constant steady winds. It’s a true wind fighter. The design started with a page of ship designs based on direct relationships to the flare countermeasure that provides a decoy to heat sinking missles. Other quick concepts went the sci-fi ship route and that aspect of the design stuck out with the group. The frame-type of motion was liked by all and continued into the rough phase. Connecting the design with it’s actual flight characteristics was important to me. I used a rough block-in 3D model to mock up the ship orientation and ported that into Illustrator. The whole intent of that process was to create motion. 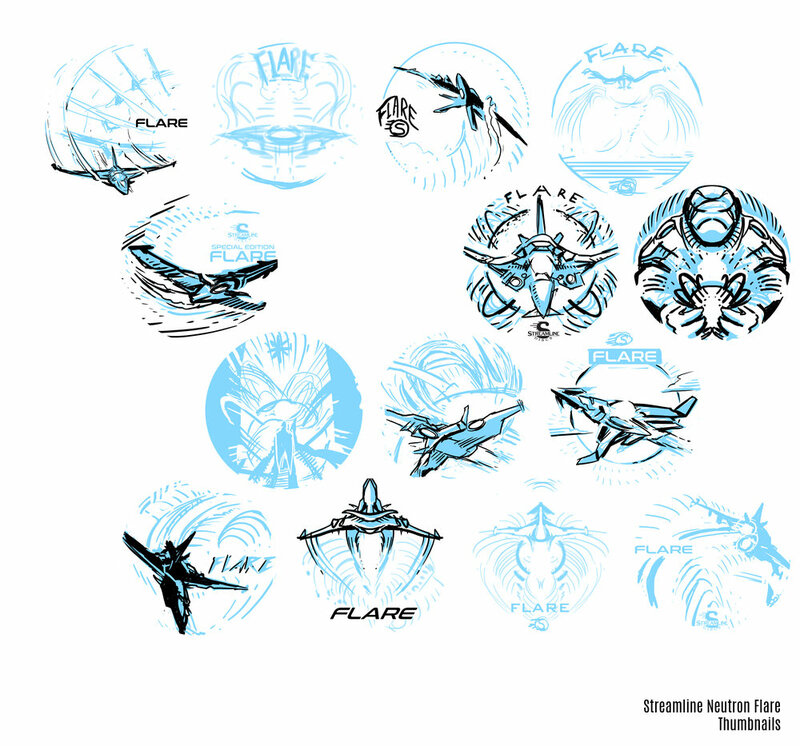 Other Streamline designs that I’ve done were in a direction where you couldn’t place a certain time period on it. It was kinda Sci-Fi/ kinda modern age but I wanted to take this into a futuristic realm. So I added lower propulsion units on the bottom and kept the edges and angles sharp. A few references of the Royal Canadian Forces doing evasive maneuvers in a valley inspired me to put atmospheric trails coming off the wings. Carrying that curve language subtracted from the “Flare” typeface finishes it off. In the end, MVP Disc Sports HQ used a new grey pigment-based foil in combination with black and white to create a truly comic-like vibe with the stamp. You can find these by most big online retailers of MVP, Axiom and Streamline on April 19th. - Need to use proper curves to make all the angles to be correct. I dig the palette and will most likely use 3d on the final to set it up. "Charon"- Based off the idea that if souls weren't buried with coins that they would have to wait 100 years until Charon would allow passage. I like the atmospherics in this one but need to refine the silhouettes of the souls to be a bit clear in the foreground. "School girl with astronaut helmet"- Well..I told myself that I was going to try and do more character work this year. Ran out of time messing to get the eyes right. Bounce lighting and visor reflections are really lacking to give it realism. A tattooed bar code or insignia on her forehead could be cool too. She seems more womanly than child like.